Interac Online is one of the more interesting payment services currently supported in the online gambling industry. It is a network of banking institutions in Canada formed with the idea to provide a more efficient system of making transactions. It was first established in the mid-1980s with five founding members and since then, it has grown to include over 90 organizations and institutions and has become a force to be reckoned with in Canada. In recent years, Interac has launched the Interac Online service which allows for payments to be made over the Internet. It has been quickly adopted by the online gambling industry and is now one of the best banking solutions available to Canadian casino players. It allows for quick and convenient payments, giving gamblers the opportunity to easily manage their bankrolls at online casinos that support the service. Many of the large Canadian brands support Interac Online and a growing number of Canadian gamblers are currently using this banking solution. With it growing in popularity, it is prudent to take a look at Interac Online and see how it stacks up against other prominent payment services in the industry. Below, you will find detailed information about how Interac Online works, the fee structure, as well as, the benefits and detriments of using it for the purposes of online gambling. The Interac Online service has several different aspects which will certainly come in handy when you decide to make transactions. Moreover, you will also be able to issue payments in several different methods. The Interac service is made up of Interac Debit, Interac Flash, Interac e-Transfer, Interac Cash and Interac Online. Below, we will cover all of these aspects and give you some idea of how they work. Interac Debit is one of the fundamental aspects of the Interac service and it will surely come in handy. With Interac Debit, you have direct access to your funds wherever you go, thanks to the debit card issued and sent to you. With it, you can make purchases at over 500,000 retail locations spread out all over Canada, indicated by the Interac logo at the checkout counter. The transactions are approved online and carried out in real time. This means that the funds are transferred directly out of your Interac balance and to the merchant’s account. Furthermore, you can only spend money that you already have in your balance and the service does not extend credit to you. With this in mind, you do not need to worry about racking up debt when using Interac Debit. The debit card works much like any other bank card you have seen. To use it, it needs to be entered in the POS terminal and you have to enter the PIN code to confirm the payment. It is secure, convenient and easy to use. Of course, you will need a positive balance before you can use it. Interac Flash is an innovative method of making payments at retail locations with only your smartphone. It is a contactless debit solution where you simply hold your smartphone near the POS terminal and the payment is complete. There are some requirements for using Interac Flash, the first and most important that you have a smartphone with NFC (Near Field Communication) capabilities and access to the Internet. 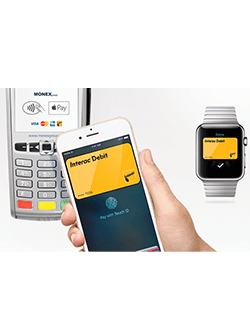 The Interac Flash service also needs to be supported by your bank of choice and you need to have the bank’s mobile application installed on your device. On the Interac website, you will find a list of banking institutions that support Interac Flash. For security purposes, Interac Flash can only transact up to CA$100 at a time. Interac e-Transfer is one of the most used aspects of the Interac service, allowing you to conduct transactions and request money in a fast and convenient manner. Making payments is easy with Interac e-Transfer, requiring only the recipient’s mobile phone number or an email address. Sending money is not a hassle in any way, all you have to do is log into your Interac account, select your financial institution, and enter the appropriate information. From this point on, you can fill out the email or phone number of the recipient and confirm the payment. The ability to request money via Interac e-Transfer is another major feature of the service. If you are expecting to receive funds then you can easily make that happen. To do this, simply log into your online banking and look for the Request option in the e-Transfer section. You will need to fill in the other person’s name and email or phone number, with also the possibility to provide an explanation for the request. Enter the amount that you wish to be sent and confirm the request. Transactions within the Interac e-Transfer infrastructure are processed almost instantly and the receiving party will have their funds in a few seconds. The same is true for when you are being sent money. Interac Cash is a service which allows you to withdraw funds from your bank account at Interac-branded ABMs. With this service, you will be able to easily take out funds in almost every corner of the country with complete easy. Interac Cash is entirely secure and you need not worry about your money becoming compromised. The withdrawal process is quite simple and is likely nothing that you have not done before. All you have to do is put in your debit card into the machine, confirm the withdrawal and enter your PIN. You should keep in mind that there may additional fees and changes, determined by the owner of the ABM. Interac Online is the last and final component of the Interac service. It provides users with a quick and secure payment solution for making transactions on the Internet. You can use this not only at hundreds of online stores but at gambling websites, as well. This transaction method does not reveal your personal or financial information, allowing you to maintain your privacy. Making the payment is quite easy, not unlike any other with Interac. The transaction will be processed quickly and the money will be transferred almost instantly. As is the case with any online payment service, there is no end-all-be-all solution. Each banking method comes with its own set of advantages and disadvantages and it is up to you to weigh the positives and negatives to form your own opinion. Right now, we will go over all of the relevant qualities of Interac see whether or not this payment method is worth your time. Starting off with the advantages, we are happy to report that Interac has many of them. To begin with, it is widely accessible and supported by a large number of Canadian online casinos. These gambling websites know their user base and are trying to appeal to the largest number of players possible. This also means accepting payment via popular services in the region. Interac enjoys a large user base and is one of the primary online banking solutions for Canadian gamblers. As a result, there are few online casinos that do not accept it. What this means for you, is that if you become bored with one gambling website and wish to switch to another, chances are that you will be able to use Interac at the new casino, as well. This negates the need to set up a different payment service to control your bankroll as it readily available at your disposal. Furthermore, Interac’s main goal from the beginning was to create an infrastructure where domestic payments can be made easily and efficiently. At the time of writing, more than 80 banking institutions have entered into the network and have chosen to participate. Therefore, you will likely be able to connect your bank account to Interac and issue and receive payments with complete ease. Speaking of payments, those made via Interac are processed quickly and at low cost. Interac is one of the cheapest banking solutions out there and if you choose to take part in it, your bottom line will hardly be affected by transaction fees. Moreover, you will also enjoy the benefit of instant deposits to your online casino balance and speedy withdrawals, where available. Last but not least, Interac does not only offer you a way of managing a casino bankroll but it also has applications in the real world. While the online casino industry supports a wide range of banking solutions, not many of them can be used outside of it. Interac, on the other hand, has been a standard for online banking in Canada for years and is a stable banking network, with hundreds of thousands of businesses accepting payment via the service. This is not something that you should underestimate rather take into serious consideration. As for the disadvantages, there are not too many of them, but some are worth mentioning. To begin with, the Interac service is only available to Canadian residents. After all, to use the service, you need to have a bank account with a Canadian institution. This automatically disqualifies foreign individuals and anyone who wishes to make use of the service. The problems that eligible Interac users face mostly boil down to acceptance. While casinos that appeal to the Canadian market support Interac, those websites aimed at other markets will likely not accept it as a payment solution. This is unfortunate as there is a wide range of online casinos available to the Canadian user base and if it so happens that you like one of these websites, you will have to resort to a different banking solution. While this problem may disappear down the line as Interac becomes more ingrained in the online gambling industry, the present state of the online gambling scene does not hint at it becoming a reality in the near future. As we have mentioned above, Interac is one of the cheapest online banking solutions out there and we will explore into more details how the fee structure is set up. Each aspect of the Interac service comes with its own unique fees and charges, though even the highest will not break the bank. Using Interac Cash to withdraw money at ABMs will result in a Switch Fee of CA$0.006243, while the Switch Fee for Interac Debit and Interac Flash will be CA$0.005759. 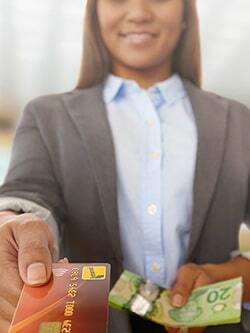 The Interchange Fee for the use of Interac Debit will be a flat CA$0.75, while the same fee for Interac Flash and Interac Debit will be between CA$0.02 and CA$0.035. Something that you should take into account is that withdrawing money from an ABM may come with additional charges, determined by the operator of the machine. The Interac Online charges will vary, though the fee itself will usually range within the CA$0.115 to CA$0.265 limit. Overall, Interac offers very cheap transactions when compared to many other payment services and we are certain that you will appreciate cost efficiency. Another thing to consider when choosing an online payment service is the speed of the transactions. Naturally, you want a banking method that will process your deposit quickly so that you can immediately get to playing your favorite casino games. While traditional bank transfers can take days to clear, Interac transactions are much quicker. In fact, you will not have to wait for more than a few moments for a deposit to be processed. The wait time mostly consists of you filling out the deposit forms and confirming the payments. With Interac, you will be able to reliably fund your bankroll at any hour of the day and have the money be available in your casino balance in seconds. Withdrawals are also possible via Interact, though the number of gambling websites supporting this is not the largest currently. Still, those who do issue cash-ins via Interact will process your payment within the next 24 hours and then send the payment. After that, it can take up to 2 business days for the transaction to clear and for the money to appear in your balance. As with any quality payment method, you will have the option of using Interac from your mobile device. 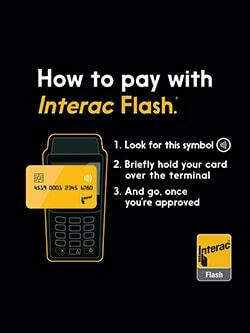 Not only are all online features available from your smartphone or tablet, but you will also be able to utilize the Interac Flash to pay with your mobile device at POS terminals. The process of making payments from a mobile device is not much different than the desktop way of doing it. You head over to the Cashier page and select the Interac option. From then on, you simply enter the relevant information and confirm the transfer. As we have mentioned above, the process is almost instantaneous and you can get to playing your favorite games. When making payments on the Internet, you should always be concerned about the security of the transactions. Interac by itself is a very secure service, incorporating many banking institutions within its network. You can always be sure that payments made via this service will be secure. Naturally, you should also be concerned about the security featured at the online casino of your choosing. In today’s industry, online gambling websites have introduced very complex security systems that are meant to protect your data and funds, should the need arise. Typically, this comes in the form of encryption software, which encodes all information that passes through a casino’s systems. Modern encryptions are ridiculously difficult to break and this is what makes them effective. Not only is the effort needed immense, but it is not worthwhile for prospective wrongdoers. When using Interac Online, you can rest assured knowing that you will be safe and that you can play your games in peace. We understand that while we have covered many of the important aspects of Interac there may be other things that also interest you. To help you satisfy your curiosity, we have compiled a list of the most commonly asked questions regarding Interac as an online gambling deposit method. Are Interac deposits eligible for casino promotions? Generally, all payments made to online casinos are eligible for promotions, provided that there is one available. While certain banking solutions, like Neteller and Skrill, may disqualify you from claiming a bonus, Interac Online is not among them. You can safely deposit to your balance to take advantage of a promotional offer. Still, we are talking in general terms here. You should always check the terms and conditions to a promotion before you deposit money with the intent to claim it. Can I use Interac Online outside of Canada? The only way that you can use Interac Online is by having a bank account with one of the partnered Canadian institutions. That is the most basic requirement and if you do not meet it, there is no option for you to use this service. If you do have an account and are not in the country, then you are still free to use Interac as you normally would. Just remember to pay attention to the local gambling laws. My casino does not support withdrawals via Interac Online. What can I do? If you find yourself playing at an online casino that accepts Interac Online for deposit but not withdrawals, you have little options available to you. Typically, online casinos will only allow you to withdraw via the same service that you used to deposit but if that is not possible, then your only other solution is to request a good old-fashioned bank transfer. Granted, these will be slower than Interac transactions, but you will have little choice in the matter. This is why you always have to take into consideration the supported withdrawal methods. Will I be required to submit proof of identification to the casino when using Interac Online? Submitting proof of identification is one of the legal requirements for running an online casino and no legitimate operator would dare go over this important rule. Regardless of the payment method that you use, you will have to provide the casino with some sort of legal documentation to prove who you are. Typically, this will come when you request a withdrawal. Being a Canadian banking network, Interac Online works only with the Canadian Dollar (CAD). If the online casino of your choice does not support CAD, then you may end up paying foreign exchange fees. How can I verify the legitimacy of an Interac Online Casino? The quickest way to determine whether a gambling website is honest is to take a look at the licensing issued by a government institution. The Malta Gaming Authority and the United Kingdom Gambling Commission are two of the most respected regulatory institutions and their mark is a guarantee that a gambling website is legitimate and that you will have a truly fair gambling experience.